New Zealand's loss was Samoa's gain in the case of back-rower Pat Lam, as he traded All Black for the blue of the Islanders after failing to win a Test cap. 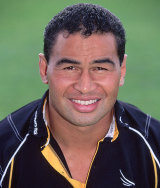 He played only once for the All Blacks, in a 1991 tour game, but won 34 caps for Samoa and played at three World Cups. He made his international bow for Samoa in their famous 16-13 upset of Wales at the 1991 tournament, eventually captaining his country. The hard edge that he possessed from years in New Zealand provincial rugby served him well as a leader and in the hard-fought back-row battleground. His retirement from the international game came following the 1999 World Cup, and a try in another upset of Wales. He continued to excel at club level and as well as turning out for Newcastle Falcons he lifted the Heineken Cup with Northampton in 2000. Following his retirement he returned to New Zealand, first taking the coaching reins of the Auckland Air New Zealand Cup side and eventually the Blues Super Rugby franchise.